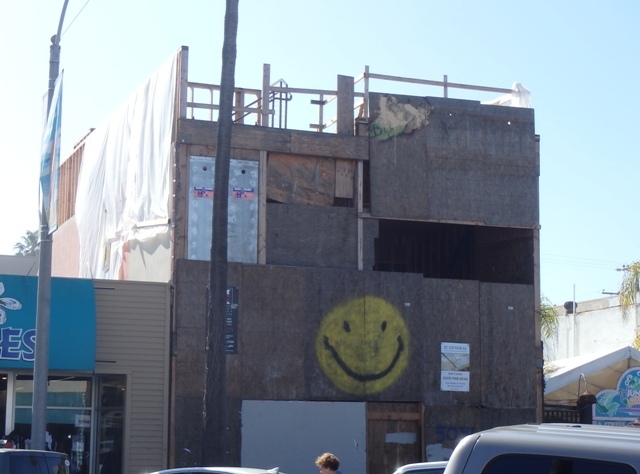 On occasion, the OB Rag publishes a survey and update on local construction projects in OB. 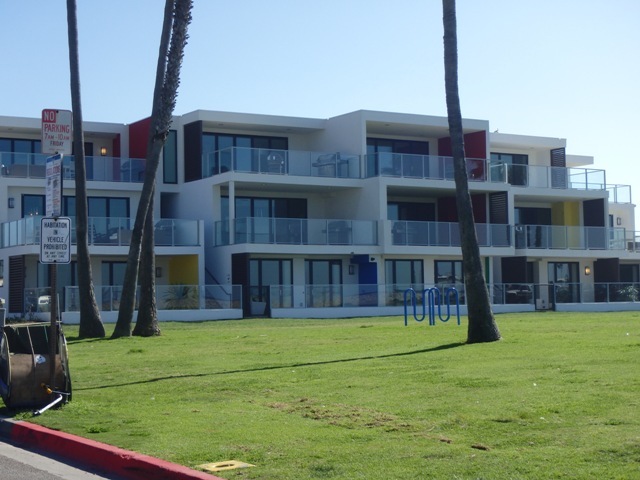 So, here is our latest – a survey of projects – in various states of development – within Ocean Beach and close-by neighborhoods in Point Loma and the Midway District. 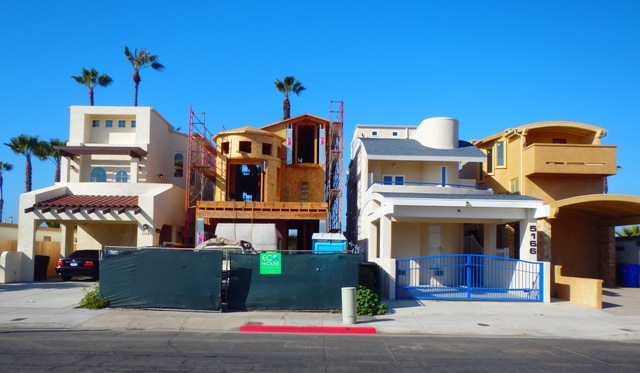 Number four has reached its framed height and stands with the others in a wall of gentrification on the 5100 block of West Pt Loma. It was this type of development that helped spur interest in having the new OB Community Plan passed by the City Council, a new plan that restricts over-development. These buildings all received waivers from the City that allowed their builders to circumvent the former OB Community Plan. Such waivers will be more restricted in the future with the new plan – still to be approved by the California Coastal Commission. The largest new development project to hit the waterfront of Ocean Beach – the Saratoga condos – appears completed and ready for occupation. Reportedly, all the units have already been leased out. The average price for the units surpass $1 Million each – and have dramatically altered the site of the former Hodad’s (and Dempsey’s) and a number of rundown apartment units. It will be interesting to see if the folks who rent out these units will place pressure on police to “clean-up” the Saratoga Park. Also interesting, will be how the project survives the first large rain storm and high tides of the season, as this area usually floods when those two factors coincide. The latest pair of the two-story houses on Santa Monica Avenue also appear close to being finished – at least the exteriors do. They are the second pair to be installed across from the OB Rec Center. A former private day school used to exist on this site, in a building that was nearly a 100 years old – which was demolished by the new owners of the property. The new pizza and beer joint being worked on by Newport Pizza’s owner shows some outward signs of progress. There appears to be something new on the upstairs deck. The place will have a brewery downstairs and then 2 floors of dining, including the deck. The project itself has dragged on – and would win the award for the longest-delayed pizza place on Newport. The large project at the busy intersection of Catalina and Voltaire seems to be close to completion, from our quick drive-by inspection. 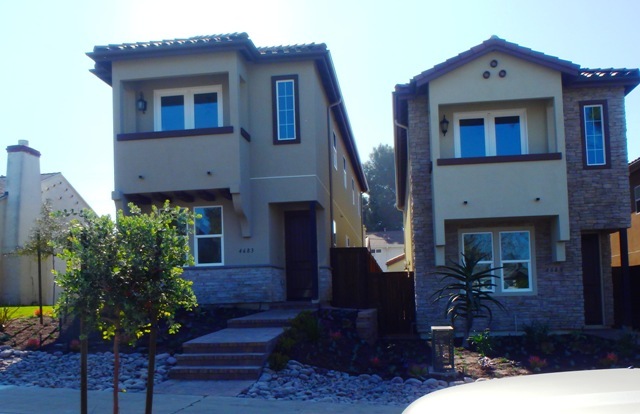 The three-story “mixed-used” development includes 8 townhomes, one flat, and one commercial space that has nearly 2130 square feet. The huge project that is being built on the site of the former Barnard Elementary School has foundations poured for many of the 180 apartment units and 10 townhomes going in at the site.This is one of the largest projects in the Peninsula, and its surrounded by 2-story apartments and condos in one of the most dense (and forgotten) neighborhoods in the city. Barnard Apartments expands on 9.5 acres which was bought by the Monarch Group for $16.5 million. 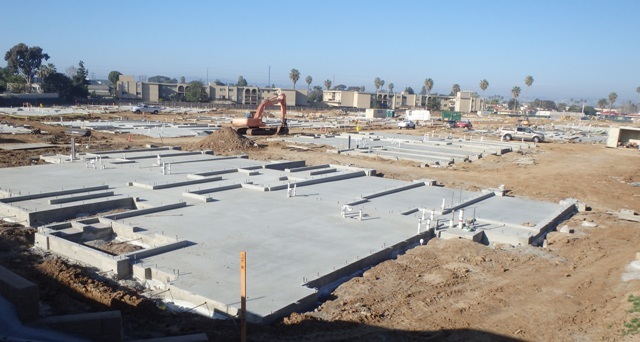 The gated community is scheduled to be complete by January 2016. West Point Loma was always a wall …. just not as tall. The Old Dominos Pizza building on Voltaire has been vacated and Honey Bear building was sold. What will be happening in this area? Any idea? Those are ominous signs. The plan for the site is another, much bigger, mixed-use project with about 28 residences and 7 business locations if memory serves me right. 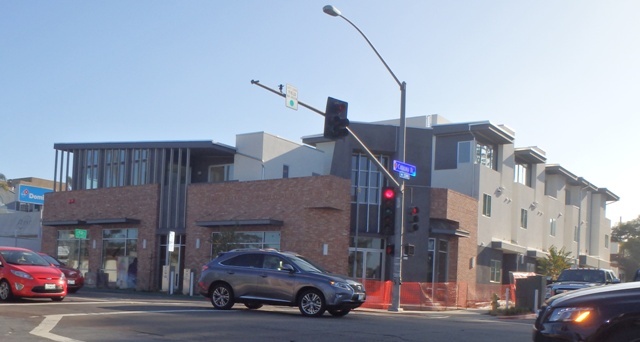 The Peninsula Community Planning Board fought this project all the way and lost at every step. It will seriously impact traffic. The main problem will be the entrance/exit from Whittier to Famosa followed by the entrance off of Voltaire. The Level of Service rating for Famosa is the worst, an F. The project did not get built when originally planned because of the recession but I suspect it has come back. And, across the street where Coconut Pete moved is another , slightly smaller mixed-use development project that may also come back. Then, another is planned shwre sunshine liquor is now located. It could get very crowded along Voltaire soon. I believe that a lot of the property on Voltaire to be developed is owned by the same person. People that will live in the new condos by 7/11 will have a hard time pulling onto Catalina blvd. One development group headed by Mike Stevens owned the development where Coconut Pete used to be. Not sure if he is still involved. The place where Pete’s moved to is a development that was owned by Jim Lester, not sure if he is still involved. Several properties in the same area are owned by the vet, Gary Rose, who is intent on further development. He planned to move his practice up above the pet store but never divulged what would happen to the building where his practice sits now next door. The corner where the hair stylist was is being changed into something but there is no outward indication of what that will be. Geoff, are you saying that those developments are still going to occur?? How do these projects get approved? Do any sort of traffic impact studies occur prior to the approvals? How will another large development add anything beneficial to the area? Where will people park? As a homeowner in this immediate area (@Tennyson/Catalina), I can attest that the traffic flow and parking is already terrible in this area. When our beloved Honey Bear was still around, a quick stop on our way out on any given morning was no easy feat. On a related note, I was on a walk with my son yesterday afternoon, and I overhead a contractor telling another passer-by that the commercial space at that monstrosity on the corner is going to be a Coffee Bean and Tea Leaf. Any truth to this? What I can say is that those projects were fully approved just before the economy went into the tank. It has been my experience that these projects come back because the developers invested money in getting them approved. Even if the original developers don’t continue, they can sell the approved project to new investors. The fact that Coconut Pete vacated those premises is a sign that the project is reawakening. When I was on the PCPB, we fought this project hard. I personally spent days on the intersection of Catalina and Voltaire taking pictures at peak time. I put together a Power Point presentation that I gave at City Council showing the backed up traffic to no avail. I included in the PowerPoint the ratings of the streets and they were all very bad but that didn’t phase the City. I haven’t heard from anyone regarding what businesses will be occupying the commercial spaces in the project on the corner. To put high traffic businesses on that corner would be idiocy but the developers only care about filling the spaces, they don’t live near this project, I assure you. I figured the project was reawakening, since Pete moved out in quite a hurry. Glad to hear that the project was fought, but disappointed that it was passed in typical City Council fashion. Ah, but there will be bike racks! The developer made a big point of that as if a few bike racks would offset the huge impact. I’ll never understand this bike rack issue, when I was a kid, we locked up to trees, fences, signs, you name it. But nowadays, if a developer tells everyone they will have bike racks, that seems to create a real warm and fuzzy that attempts to disguise the real impacts. Oh, you mean the bike racks that interfere with pedestrians’ ability to easily walk on the sidewalk? Not sure about the parking you’ve described. I’ll have to look. I stand corrected. On our nightly walk, we saw fresh red paint on that curb. By the way, does anyone know what happened to the Honey Bear business? I’m guessing it is moving into one of the new spaces. They may know more if they can explain why they shut down. Please correct/pardon me if any of this is known to be incorrect. Drove Voltaire today. Coconut Pete has taken over that cottage on the corner. How does a residence turn into a business? Or perhaps the cottage was zoned as commercial but used as a residence? I suspect since the units at the corner of Catalina sold …. the building will be soon for the other projects. The downside as you mentioned is the traffic and congestion. People are going to have to slow down and not drive so fast! Speeding on Voltaire is commonplace and dangerous to walkers and bicyclists. With the changes, I hope there are decent family style restaurants….not bars that bring drunks and noise. Most of Voltaire st is zoned as mixed use commercial or residential. Understood. But how does a residential cottage turn into a business? The land where the cottage sits is zoned mixed use. It was various Chinese restaurants for many years. There used to be a cool old craftsman, a big one, on the vacant lot next to the cottage. They tore it down years ago I always assumed to make way for the new development that hasn’t yet happened, but probably will.